After the January 7 attack on the offices of the weekly satirical newspaper Charlie Hebdo, . . . an expression of solidarity soon began appearing on banners, public monuments, and social media: "Je suis Charlie." Never mind that many of those who repeated these words - including many Americans - had never seen the publication, and would likely find it offensive if they did. Even if the slogan seemed a little too easy, the solidarity was genuine. 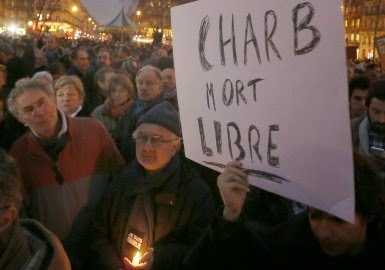 In targeting Charlie Hebdo for having published irreverent cartoons of the Prophet Mohammed, the terrorists, Cherif and Saïd Kouachi, not only attacked a legendary journalistic institution, well known in France if not elsewhere; they also attacked a principle central to all liberal democracies: the freedom to speak one’s mind, to write and, in this case, draw freely, without fear of being either locked up or gunned down . . . . [O]ne can admire its staff for their willingness to go on doing what they knew might get them killed, for refusing to let zealots armed with Kalashnikovs determine the boundaries of permissible discourse. Ross Douthat of the New York Times put it well when, after conceding that "a society’s liberty is not proportional to the quantity of blasphemy it produces," he went on, "If publishing something might get you slaughtered and you publish it anyway, by definition you are striking a blow for freedom, and that's precisely the context when you need your fellow citizens to set aside their squeamishness and rise to your defense" . . . . [T]here is . . . a risk of underreacting to this latest outbreak of violence, by treating it as if it were an isolated event rather than part of a much larger pattern. A few weeks earlier, twenty-three people were injured in Nantes and Dijon when two "lone wolf" terrorists drove their vehicles into crowds of Christmas shoppers. Around the same time, an Islamicist took eighteen hostages in a Sydney café; two of them were killed. Two months before that, a down-at-heels Muslim convert killed a Canadian reservist at the National War Memorial in Ottawa. The list goes on. Some of these attacks may have been planned and funded by terrorist organizations in the Middle East; others appear to have been alarmingly spontaneous. But they were all inspired by the same poisonous ideology, which turns alienated and insecure young people into suicidal jihadists. It is no good pretending this ideology will disappear or cease to afflict us if only the Charlie Hebdos of the world can be persuaded to exercise a little more tact and self-restraint. The groups behind these attacks are demanding vengeance or submission, not better manners. Commonweal is a very liberal Catholic magazine, but it sees the problem quite clearly in this instance: courtesy will not satisfy these Islamist ideologues; only resistance will keep such wolves from the door, whether they be lone or in packs.